Recorded at Wilton’s Music Hall, London, November 5th, 2010. 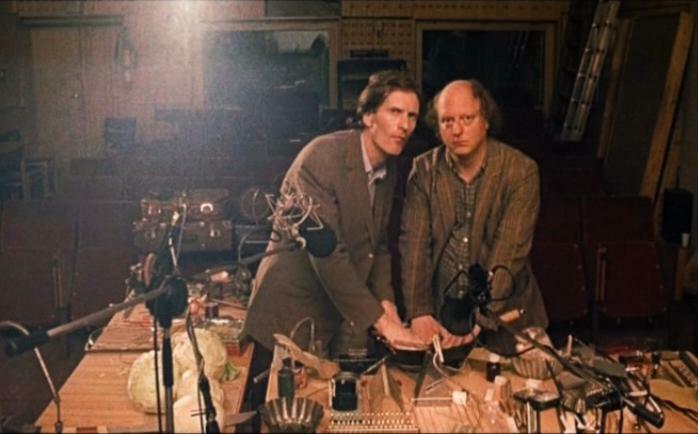 London based Jonathan and Adam Bohman aka the Bohman Brothers, are known for their unique experimental sound based live performances which use found objects, text and an innumerable array of sound sources. Their humourous visual set-ups which resemble hard-wired flea markets, are the basis from which the duo, in the spirit of Fluxus, musique concrète and sound poetry, create their often grotesque soundscapes freely quoting from any source available to them. Found texts such as advertising spiel is juxtaposed with sounds ranging from amplified shoe brushes to a tape cutup of seventeenth-century instruments. One of two cylinders recorded in rather chaotic post-soundcheck circumstances at Wilton’s Music Hall, prior to the Bohman Brother’s performance for Sound And Music/BBC Radio’s Cut & Splice Festival. The first attempt at recording failed and the cylinder was only partially inscribed; we then superimposed a new recording directly over it, and some of the previous voices embedded in the wax may be faintly heard in the background. The cylinder surface was also quite uneven and patchy giving rise to the loud noises and bumping sounds that accompany the Bohman’s delivery of found texts.